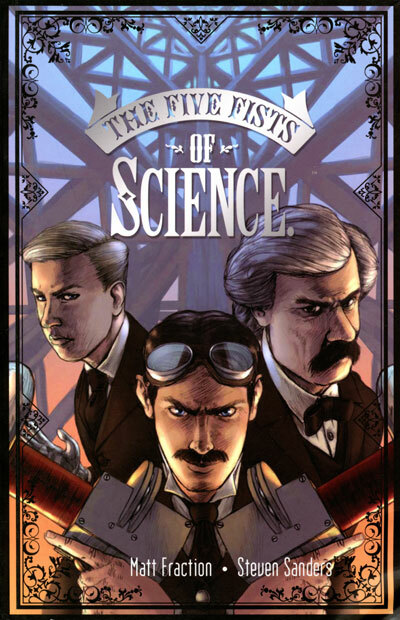 This comic book was actually one of the first Steampunk purchases I ever made, but somehow hasn’t made it into my review rotation until now. Perhaps because it wasn’t until I reread it this week that I fully understood the story. I remember that I liked it, and that the artwork was great, but I couldn’t remember the plot at all until I got a few pages into my second reading. It is a tight little book that doesn’t waste any pages which is definitely a feat, but it did make things a little hard to follow. The first few pages of this book by Matt Fraction (artwork by Steven Sanders) are excerpts from essays by Mark Twain and Nikola Tesla, who are also the stars of the story. Reading these essays and the character biographies that follow are very important for getting the most out of this book, so resist the temptation to skip them to get right to the meat of the tale because you will need them to better understand what follows. The story begins during Twain’s financial “exile” (ie he is totally broke) when he is living in Austria. He goes back to New York to visit his brilliant but eccentric friend, Nikola Tesla, who has just had an incredible invention rejected by the US government. Twain convinces him that what he needs is a little salesmanship and flare to get the worlds’ leaders on board with a plan to bring about world peace through superior fire power. Little do they know that Thomas Edison, Andrew Carnegie and J. P. Morgan are dabbling in the black arts, and have a totally different idea of how the world should look. I would definitely recommend this book to Steampunk fans, especially those who are tired of reading about London all the time. Mark Twain, the original celebrity, and Nikola Tesla were incredibly interesting people, which makes for a very fun (if not totally accurate) narrative. I got my copy at a comic book shop a few years ago, but you can also find it on Amazon. That looks rather cool. Not everything I’ve read by Fraction has grabbed me, but he’s certainly capable of developing innovative ideas, and I think I might have to check this out. 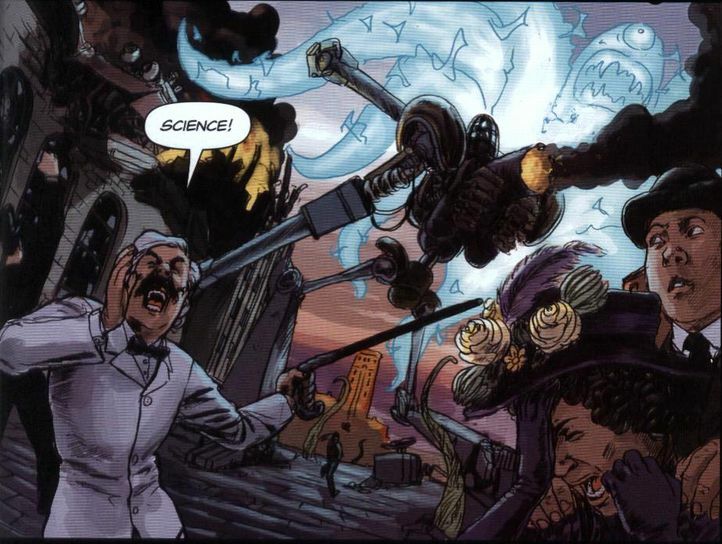 You can’t beat a good steampunk comic. In the end I couldn’t resist, & spent some of my hard saved Lego money on this. Really enjoying it so far. Twain in particular is very entertaining.